ISC West 2016 — Las Vegas, NV (April 6, 2016) – DW®, the industry leader in digital recorders, surveillance cameras and related management software, has announced the release of a new app for Apple TV devices. 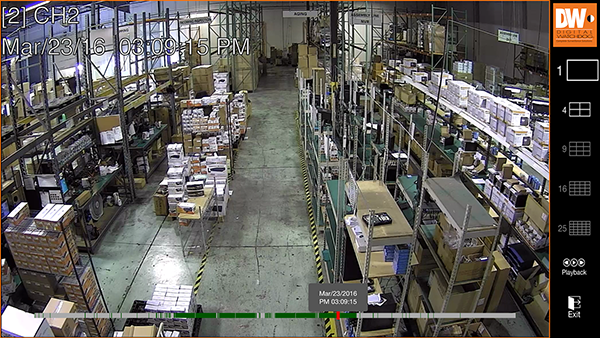 The DW Site Viewer lets you view a DW® surveillance system using an Apple TV. Our new DW Site Viewer will be demonstrated at the ISC West Security Industry Trade Show, April 6-8, 2016, in Las Vegas, Nevada, Booth 17089. The new app makes it possible to quickly enter and save the information for one or multiple surveillance sites and then choose to monitor the cameras from one of those sites with the click of a button. The DW Site Viewer app for Apple TV joins the DW Mobile™ apps, DW VMAX™ app, DW Spectrum™ app, DW Spectrum IPVMS client and Pivot™ CMS as convenient ways to view your DW® cameras remotely. Monitor all the cameras from a single site. Use convenient thumbnails to choose a site to view. Simply click between 1, 4, 9, 16 and 25 camera modes. Quickly review video by date and time. One button review at intervals of 1, 10 or 30 minutes, 1 hour or 1 day.